Sales of this product are going to be moved to our new website. Please call our office for updated prices and product availability! One of the most economical ways to package-up your duplicate coins! The 2" x 2" coin envelopes are by far one of the most economical ways to package-up your duplicate coins for filing or storage, and with the variety of seven different colors we have available you can even color code your coins by denominations if you like. Gold - Out of stock. 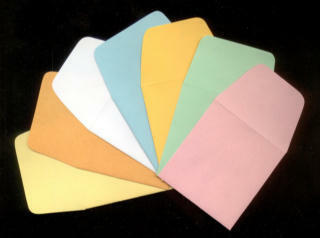 We have tried to display the color match per envelope, to the best of our ability. We have no control over the manufacturing process used to create these colors. Please note: Different monitors and their settings will also effect the process of color sampling. Please keep this in mind when considering paper coin envelopes to package your coins. All paper, unless specially made to be sulfur free, will have a sulfur content to some degree, and this is what will in time tarnish coins. So, we do not recommend paper coin envelopes for any coins in About Uncirculated, Uncirculated or in Proof condition. But they are great for those inexpensive circulated coins! 50-249 .05c @ / 250-999 .04c @ / 1000+ .033c each - Per Color Choice. Minimun Order 50 Envelopes per color. Need a storage boxe for 2" x 2" envelopes? - Click on this link!